After a month-long journey through the American midwest and two Canadian provinces, we arrived safely home a few days ago. Fresh vegetables were scarce as we traveled the interstates, and consequently they are what we crave. Let there be salad–and all manner of greens and farmers markets! Fried foods have been banned for the foreseeable future. It is lovely to be back in the kitchen, and while I get back into my groove, this recipe was one we enjoyed just before we left. Tucked into these addictive summer rolls is one of the best salads I have ever tasted. The inspiration for the salad combination came from Put On Your Cake Pants. Her recipe for Mango Thai Chicken Salad is truly exceptional. So I stuffed many of those incredible flavours into moist rice wrappers, and some seriously delicious summer rolls were born. I incorporated that out-of-this-world peanut sauce right into the filling. Rolls like these are perfect for when you want the refreshing flavours of a salad in a different format. And you can take your pick of protein. Shrimp or chicken or even some seasoned tofu are all good options when combined with the crisp lettuce, cucumbers, mango, cilantro and peanut sauce. More salad, less oven. Amazing taste. Cool and simple. There are so many reasons to make these summer rolls again and again. And I certainly will. Whisk together peanut sauce ingredients until smooth. Soften each rice wrapper by submerging one at a time in a plate filled with hot water. Transfer moistened wrapper to another plate or counter and place shrimp or chicken, lettuce, cucumber, peanut sauce, and cilantro near the middle, but at a place about 3 inches from the near side of the wrapper. Carefully fold both sides of the wrapper inward and then roll from the bottom to form a burrito-like package that encloses the filling. Transfer each roll to a serving plate. Cover and chill until ready to serve. I’m sharing this here and at Allergy Free Wednesdays. yum! these look SO delicious.. these are perfect for summer. definitely craving one right now. love it! Love these and have been pleasantly surprised by how easy they are to make. These look perfect! I love summer rolls! I hope you get to try them with the peanut sauce. It’s SO good! I love the idea of turning a salad recipe in a roll recipe! And they really look so fresh! Perfect for a hot summer day when you don’t even want to think about entering the kitchen!! Yes, they are ideal for summer, especially since we don’t use air conditioning. These look perfect for summer picnic!! My mouth is watering just looking at these! I hope you get to make them soon! Bon apetit! These rolls are the best thing to eat during summer! I recently bought wrappers but did not know what I wanted to do with them. I would love these with the chicken. I am glad you shared this. 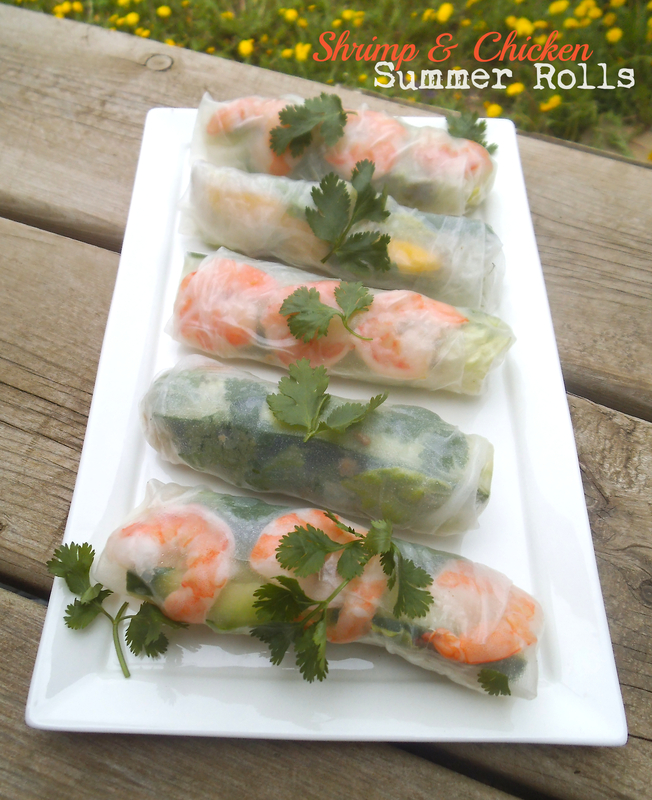 Summer rolls are my favourite way to use rice wrappers. Enjoy! I love food like this, so packed full of flavour and super healthy too. This has been featured as one of my favourites over at Sweet and Savoury Sunday. Stop by, grab a button and link up again with us this week. Have a great day! I’ve never made hoisin sauce, but I found this peanut sauce easy to make. It would be a great dipping sauce for other DIY Asian meals. In China I always enjoyed the tofu wrapped cucumbers with hoisin sauce. Have you had those? Well, I’ve had tofu dishes and cucumber dishes, but I’ve never had them combined before. Sounds delicious! 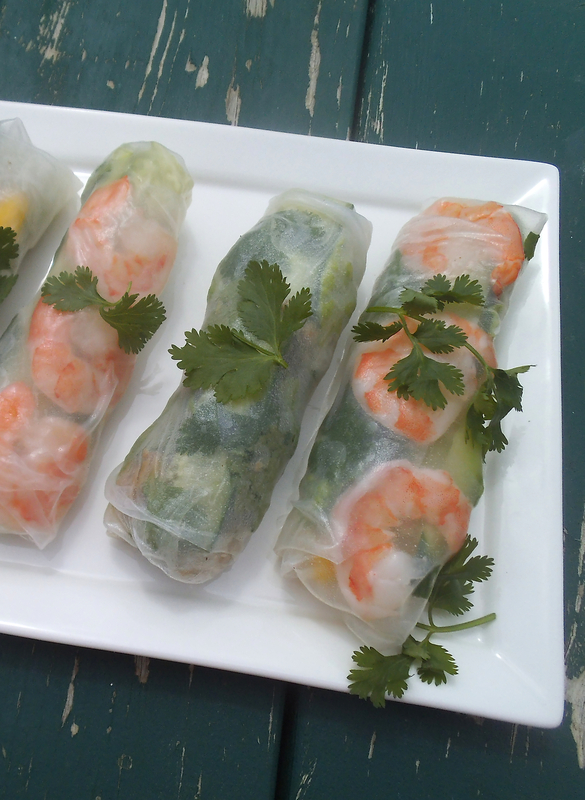 I love summer rolls and yours look perfect and so tasty!